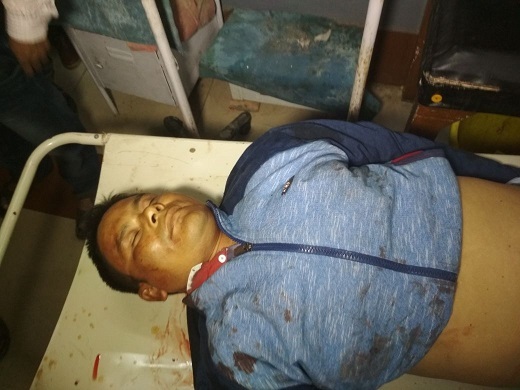 Suspected militants on Monday unleashed a reign of terror killing father son duo at Hunjan village under Bordumsa police station in Tinsukia district of upper Assam. According to reports a group three suspected militants in army camouflage entered the residence of Anteswar Mahanta at Simoluguri village in Dirak Hunjan a border area between Tinsukia district of Assam and Namsai district of Arunachal Pradesh. They came at 8 p.m and after a brief conversation with Anteswar mahanta and his son Karun Mahanta fired on them. Both Anteswar and his son Karun died on their way to Tinsukia. The deceased Anteswar Mahanta was an active VDP president of the village while his son was an active AASU activist of Doomdoma regional committee. Though the security forces swung into action immediately after the incident yet it has once again exposed the lacunae in the security arrangement in the entire area. It may be mentioned here that recently militants of ULFA-I attacked the factory of MKB tea estate at Konapathar under Bordumsa police station that sent shivers down the spine of tea estate managements who approached the authorities seeking security cover. The ULFA-I militants served extortion notice to the tea estate and warned closure of the tea estate if their demand was not fulfilled. A sense of insecurity has gripped the people of the entire area. They also expressed resentment before NE NOW about the serious security lapses and questioned how the militants could flee after firing on the factory under the very nose of the security personnel deployed there.